Shadowhouse Creations: Photoshop Tip "Brush Fading"
BRUSH FADING, here's a Photoshop brush tip many of you may not have heard of, or maybe it's something you may have forgotten over the years. There's a way to make a brush "Fade Out" as the stroke continues. Almost like a real paint brush would. Select a basic brush with your "Preset Picker." About 25 pixels or so would be a good size. 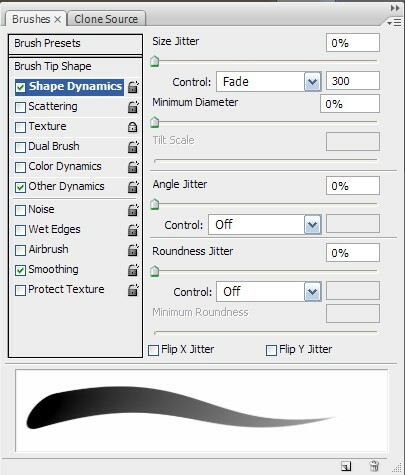 Now, click on the "Brushes" tab on the upper right of your Photoshop working space ( or hit F5 ). Now, next to the Control under "Size Jitter", click the small arrow on the right and select "Fade." In that small box to the right of it, put in a number, somewhere between 50 and 300. Depending on how long your line is. This value is how many pixels out you want the line to go before it starts to fade out completely. Now take the brush and paint on your canvas. You'll see it "Fade Out" as it goes on. What it's now doing is becoming smaller and smaller until the brush size is 0 pixels. You can also make it actually fade out. 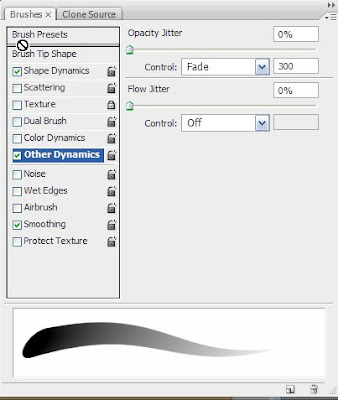 Instead of (or in addition to) clicking on "Shape Dynamics," click on "Other Dynamics" under the brush tab menu. Set everything to 0% and "Off" as before. Under the "Opacity Jitter" slider, change the "Control" on that to "Fade." Now, in the small box to the right of it, put in a value like you did before, 50 to 300 pixels, or as long as you need it to be. This works the same way, but it will actually fade out, instead of getting smaller, and actually I use both settings. They both have their own different uses, but also work very well together. Well, hopefully you learned something new here, and you may want to keep an eye out for more Photoshop tips in the near future. Great tip. I didn't know this. Striking site! I love it. Thank you so much for your helpful tip! I didn't know it either - many thanks for continuing to post such fascinating, and easy to follow tutorials Jerry! btw - I love your website and all the textures you share with us. Thank you for the great information and textures! Thanks for your informative information.. !! !